I'VE never seen a place so insistently pretty as Cesky Krumlov. The town of 14,000 people (and up to 5000 tourists daily) in the Czech Republic's Southern Bohemia is a cram of cobbled alleys, orange-tiled roofs, walls painted with trompe-l'oeil masks and niches. It's also a Unesco World Heritage Site, with 300 protected buildings in the Centrum alone. You almost need a permit to move a pot plant. Tucked neatly beside the Vltava River, Cesky Krumlov - the name means "crooked meadow" - works assiduously to keep itself visitor-sweet. You can't take a car into the Centrum without permission. Tourist coaches park a kilometre away; then you walk. The Communists disapproved of Cesky's bright colours, and painted everything grey. When their regime ended, so did the drabness. Now walls in pink, blue and terracotta glow on all sides. The 800-year-old town is clean as well as bright. Every morning at 6am, headscarved women with brooms and dustpans sweep downtown Cesky. I saw two hurrying to pick up a discarded tissue. Hotels are very comfortable and very folk-furniture, with carved chests, spine-warping stools, paintings of kerchiefed peasant maids. There's a restaurant every 15 paces. The Centrum alone holds 80-plus eating places. Try onion soup with dumplings; goulash with dumplings; raspberry tart (dumplings optional). It's a town stacked with museums. The Folk Puppet Museum; the terrifically tacky Torture Museum (be photographed on the rack and/or buy your own thumbscrews); the Archaeological Museum; the Wax Museum (legendary Czechs such as Harry Potter and Michael Jackson); the excellent Porcelain Museum. Do take in the Egon Schiele Museum and Gallery. The edgy, early 20th-century Expressionist painter was welcomed to Cesky Krumlov with open arms, till burghers learned about his off-canvas technique with women models; then he was expelled with pointing fingers. Schiele's big, unsettling portraits with flesh in green and yellow, plus his unexpectedly lovely townscapes, fill two floors. Do visit The Castle, rising above the town on a crag so steep you expect it to topple on you. Actually, you can't miss it - its gaudy, galleried, 18th-century tower is on every second postcard. You enter over a moat where brown bears mope among their own excrement; the SPCA isn't big in Middle Europe. The Rosenberg family ran Bohemia for decades; their five-petalled rose is everywhere in The Castle. So are their portraits across the generations. The kids were always painted with anticipated adult features; to show their youthful faces was seen as a threat to their reaching adulthood. Rosenberg coats of arms also abound. Their symbols changed with the family's military victories; after one they added a severed Turk's head being pecked by ravens. There's a gilded coach that was built to carry the Rosenbergs 8km through Rome, then never used again. Every room has at least one bearskin rug; best of luck to the present inhabitants of the moat. In the ballroom, painted crowds of masked revellers peer from around corners or into fake mirrors at their own reflections. An astonishing 18th-century theatre, restored after 30 years' work, can change a forest to a prison in 12 seconds. Because of its age and its tinder-box wooden construction, the theatre is used only once or twice a year. 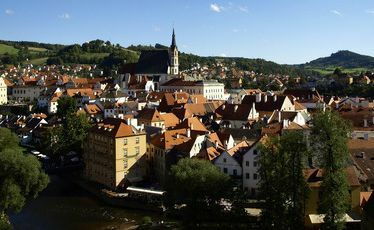 There are unadvertised bonuses in and around Cesky Krumlov. You can raft the Vltava. You can bike beside it, past trees where swallows swoop and red squirrels ribbon up trunks. You can amble into woods of lime, oak, spruce and scarlet rowan. There are hazards as well. Using up your camera capacity in a day is one. Being stabbed by the umbrellas of tour parties is another. Dumpling overload, plus the cultural dislocation of coming across saffron-robed Buddhist monks checking out the stand of Bohemian Beer Fest T-shirts should also be mentioned. But surrender yourself to a place so sweet it makes your fillings ache, and you'll have a grand time. Just don't be seen dropping a tissue.